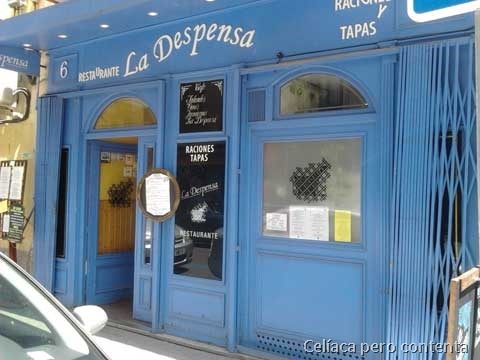 From Monday to Friday they have a 3 courses + dessert menu for 10,50 Eur. It’s convenient to make a reservation so they can have gluten free food, like bread, ready. For starters we could choose between gazpacho or consommé. I chose consommé. Then I had sauteed spinach with raisins. As main course I had a battered steak (with gluten free flour of course) and french fries (fried on a fryer dedicated to french fries only). For dessert I had fruit. Oh, by the way they also have gluten free beer. It’s a pity I didn’t take more pictures but you know, when you are hungry you remember it when the plate is empty and there’s nothing to photograph. 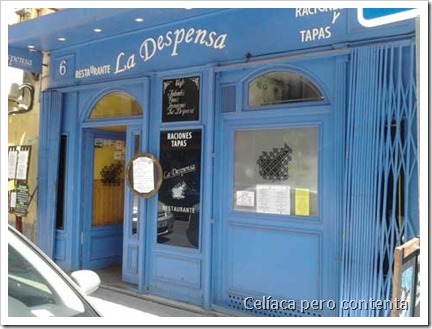 “La Despensa” is located in Madrid, on Cardenal Cisneros Nº6, close to Bilbao Roundabout. Metro “Bilbao”. Parking on Fuencarral St. They are open Mon. to Sun., from 13:00 – 16:00 and 20:00 – 23:15, except on Sundays and Mondays when they close in the evening.